We now ship immediately with receipt of your order! All of our systems now come standard with the new SILENCER technology for even better airflow and no pad noise! 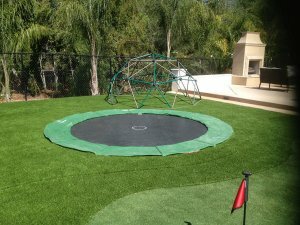 Our brand new, all American made, In-Ground Trampoline System is our finest product ever built. Conceived and manufactured in the USA from the very best materials available, our new trampoline system now comes with an even easier installation procedure requiring less excavation and dirt haul-away! In-Ground Trampolines is the only US made trampoline specifically designed and engineered to go into the ground. Unlike other in-ground systems, this is not a converted above ground trampoline. Common concerns such as airflow, corrosion and water collection in the pit have all been addressed with our one-of-a-kind design. Plus, we offer a complete and comprehensive warranty on every component of our product. There is no competition! Our all-new, super heavy-duty frame is constructed from 14 gauge steel tubing and is supported by 18 gauge steel wall panels. All our steel is galvanized for maximum corrosion resistance promoting long-term use. All this steel is fastened together with stainless steel hardware. Our 15’ IGT system has the highest spring count in the industry with one hundred and twenty 8.5”, STAINLESS STEEL, tapered springs for a deep, soft, high performance bounce. And, our new maximum air flow jump surface, with STAINLESS STEEL D-RINGS, allows 20X better air flow than conventional jump surface materials available on the market. These advantages give the IGT systems unrivaled performance. Our redesigned pads, are now attached to the frame using a unique bungee system that offers flexibility to decrease stress on the seams and ensures the pad stays in its proper position over the frame. Constructed with heavy duty, 22 ounce, UV resistant vinyl, the new Gen-Next spring pad covers are 18” wide and more than an inch thick. They are available in Blue or Green and Light Grey.